There they sat. Spines showing and alphabetized by author: never moved, read, or enjoyed. I would gather some for Poetry Friday, only to realphabetize and let them sit until the next week. I couldn’t seem to encourage poetry reading. I had envisioned poetry books flying off the shelf. That didn't ever happen. I thought I didn’t have enough poetry books for 22 second-grade readers, so I started adding more titles. I created a nonfiction poetry book tub. I occasionally read a poem, and still my poetry shelf stayed full. In the busy hustle and bustle of a new school year, I discovered a problem. Returning from an hour of recess and lunch was an unsettling transition. It was taking longer than expected. I needed something to reconnect our classroom community and bring us together for learning. I wanted something short and enjoyable. 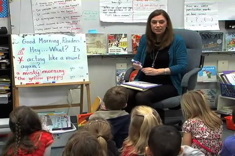 We returned to reading workshop, but it didn’t feel right to jump into a minilesson. I was looking for something like a math warm-up. The more I thought about it, the more I realized poetry could be my language arts warm-up. I started to read and enjoy three or four poems daily with my students from the same poetry anthology during this quick transition, reading each poem in the book from the front to the back. In time, this little change to help with a transition started to create a community of poetry readers. The first small celebration I had around poetry was when I received an email from a mother requesting poetry book suggestions for her daughter. She admitted poetry wasn’t something she read. Her daughter had found an old book of poetry at home and was trying to read it. She was hoping to find something a little easier for her to read independently. I recommended collections put together by Lee Bennett Hopkins. On the next Poetry Friday, that old poetry book from home came in to join us for the morning and had a bookmark in the middle of it. My student enjoyed sharing it with friends, and others said they might go home and look for books of poetry. When books start traveling from home to school, there is always a reason to celebrate. Then I had a few students ask where the poetry section was in our school library, because they wanted to find a title I had just read. I went off to help another student while encouraging this student to browse the poetry section. It's one thing to ask where the poetry books are in the library, but another little celebration came when books of poetry started showing up in students' checkout stacks. My students were really excited to share with a classroom guest reader how a poetry anthology title comes from a poem inside the book. I had shared with them that I sometimes feel like a detective when I read poetry because I am looking for the poem that makes the book’s title. I happened to glance one day from my rocking chair at our row of book boxes only to notice there were several poetry books tucked safely inside different boxes. 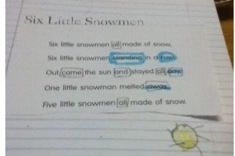 Students were choosing to read poetry independently during the week, and not just for Poetry Friday. I read the poem "Ambush" in The Great Frog Race by Kristine O'Connell George and thought students would react to the ending "Oh, no!" but they didn't. The room was silent. I thought it was a great topic for young students. There's a wonderful illustration with it in the book, and I was puzzled when they didn’t have the reaction I expected. I didn't want to tell them about my reaction, so I decided to reread the poem. I started to see some eyes and eyebrows twitching a bit, a telltale sign some deep thinking was happening. I reread it a third time, and the reaction I was hoping for came. I was reminded that rereading for meaning might be easier with short poetry pieces. I noticed there were more rhyming words. Maybe turning the pages does create longer pauses, making the flow of the poem a bit fragmented. However, I love being able to focus on one bird at a time and study the illustrations. Either way, this day my students taught me to read the poem across the pages and again as one piece to notice different things about the way the poem was crafted. 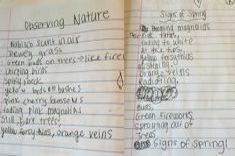 In isolation they were small events when I read the poems, but when I started making a list, I realized students had become poetry readers. They were choosing poetry to read and enjoy. They were using reading strategies and thinking about the words. They were noticing craft moves. They began asking and wondering what our next poetry read-aloud would be when one ended. Transitioning with poetry finally made my second graders enthusiastic readers of poetry. 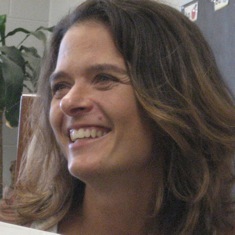 Gigi McAllister shares suggestions for infusing poetry throughout classrooms and the literacy curriculum all year long. Shari Frost explains how teachers get creative with poetry notebooks. Sean Moore uses the poem “The Busy Ant” for partner work and discussion of fluency and vocabulary with his second graders. Second-grade teacher Linda Karamatic has been starting her morning with a message for years. The morning message is just one part of her daily opening that reinforces community.